Named after an ancient Udo Lindenberg album, this quartet from Dortmund actually doesn’t have much in common with the legendary German singer. Instead they are deeply rooted the glorious Eighties when indie music had its most fertile era. Looking at the musicians, it seems obvious that some of them had reached already an appropriate listening age back then, making one wonder what they have been doing all this time, as I couldn’t find any trace of previous endeavours. Most contemporary independent bands are quite unable to recreate the magic of the pioneering days, but Sisterkingkong are one of the very rare exceptions. Their music combines the lo-fi aesthetics of Pavement and Guided By Voices with the mellow psychedelia of early Mercury Rev and Neutral Milk Hotel. All the while they are never mere followers, but have an unbelievable feeling for captivating songwriting. They may only play the regular rock instruments (guitar, bass and drums), but some songs erect a special atmosphere with exceptional clarinet parts. Some of the band’s grandeur may of course lie in the hands of producer guru Guido Lucas who convinced the band to record the album live in the studio. This must have been one of the best decisions ever taken since the beginning of civilisation, because this allows the band to come up with a warm, organic sound that envelops the songs’ melancholy into a comforting blanket. She Sees Wolves is one of those albums that may leave you a little indifferent at first, were it not for the spark of promise to give it another chance. And the more you listen to it, the most details you discover, and in the end it’s not only a great Nineties styled lo-fi indie album, but could have been a milestone, had it been released twenty years earlier. This doesn’t lessen its merits though. 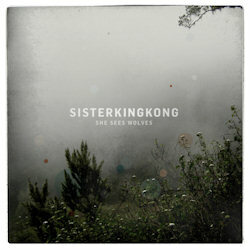 She Sees Wolves is a perfect album from beginning to end, and I hope that Sisterkingkong will be around for many more years to brighten our days with their wonderful music!